The cost to install a tank water heater in Sarasota, Florida ranges from $1,100 to $2,300. Interested in tankless units? Check out our article on the cost to install a tankless water heater or contact us for more info. Water heater “capacity” basically tells you how much hot water a tank can deliver to your home. Generally, the more capacity a water heater has, the more expensive it will be. Now if you’ve already done some research, you’ve probably noticed that most articles suggest that homeowners choose a water heater based on how many gallons the unit can hold in total (size). But a smarter way to choose a water heater is by the unit’s first hour rating (FHR). Here’s why: The FHR measures how much hot water the unit can deliver during a “busy” hour at your home starting on a full tank of hot water. This is a more realistic representation of whether the unit is right for you since it tells you how much hot water you can get at one time. Also, a larger tank doesn’t always mean it can provide as much hot water as you need during times of high demand. Here’s our recommendation: If you think your family would ever need to run 2 showers at the same time, you’ll need a water heater with an FHR of at least 40. If your family takes 3 showers within the same hour, you’d need an FHR of at least 60. Still not sure what FHR you need? 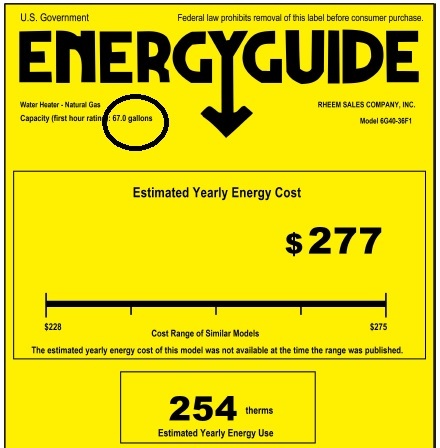 Don’t worry, the professional you hire to install your water heater can help you calculate it. The more energy efficient the water heater, the more expensive it will be. Water heater efficiency is measured by its Energy Factor (EF). The higher the EF, the more efficient the water heater. You can find the EF for a water heater on its manufacturer label. For gas water heaters (most common here in Florida), the EF can be between 0.50 and 0.80. Our recommendation is to find a water heater with an EF of 0.60 or higher. The type of fuel your water heater uses to create heat will determine how much you’ll pay. Although you can purchase solar or propane water heaters in Florida, the most common fuel sources are gas or electric. When you choose between gas or electric, it’s important to look at the long term cost. Gas is a cheaper fuel source than electricity. So while gas water heaters usually cost more to install upfront than electric water heaters, we typically recommend Florida homeowners go with a gas water heater because the money saved from monthly energy bills will pay for the cost of the unit in the long term. Higher quality contractors may charge more for their services, but you’ll also get a better installed unit, which will save you money in future repairs. That said, beware of contractors who offer super low labor costs—you get what you pay for. Need a new water heater in the Sarasota, FL area? We’d be happy to help. Give us a call or schedule an appointment online to get a fair water heater install estimate. In the meantime, visit our water heater installation service page for more information.